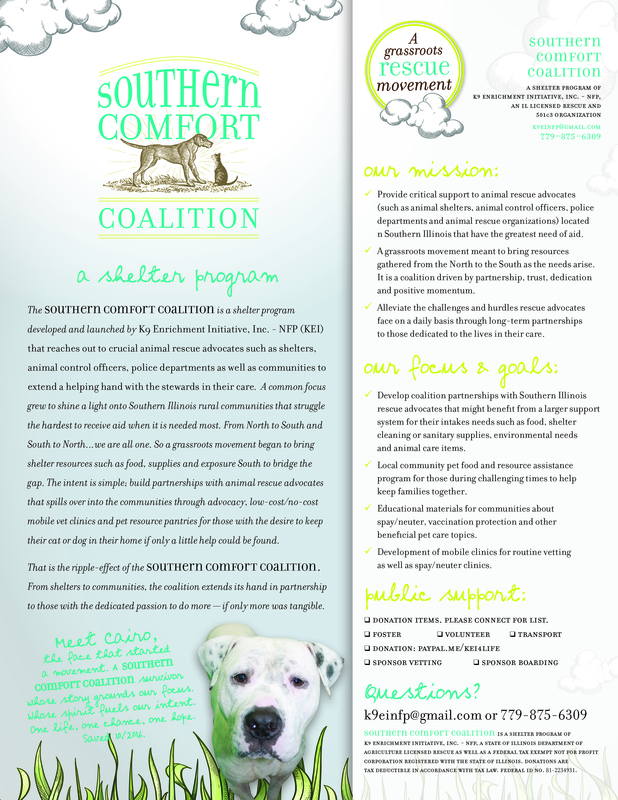 The Southern Comfort Coalition (SCC) is a shelter and community program developed and launched by K9 Enrichment Initiative, Inc. (KEI) that reaches out to crucial animal rescue advocates such as shelters, animal control officers, police departments as well as communities to extend a helping hand with the stewards in their care. A common focus [animal rescue] grew to shine a light onto Southern Illinois rural communities that struggle the hardest to receive aid when it is needed most. From North to South and South to North…we are all one. So a grassroots movement began to bring resources such as food, supplies and exposure South to bridge the gap. The intent is simple; build partnerships with animal rescue advocates that spill over into the communities through advocacy, low-cost/no-cost mobile vet clinics and pet resource pantries for those with the desire to keep their cat or dog in their home if only a little help could be found. That is the ripple-effect of the SCC. From shelters to communities, the coalition extends its hand in partnership to those with the dedicated passion for doing more—if only more was tangible. Get ready to become a medical sponsor ready to step into action when it is needed most with a life-saving medical treatment or even just a simple rabies shot that might not otherwise be available. Or provide a critical SPAY or NEUTER procedure to a community member who cannot otherwise afford it. Then we have the miracle of sponsoring HW/Flea & Tick preventative support which gives the chance of one life living to a healthy, mature age. Stay tuned as these life-changing options are presented to those with a heart that has a desire to give with a tangible result! 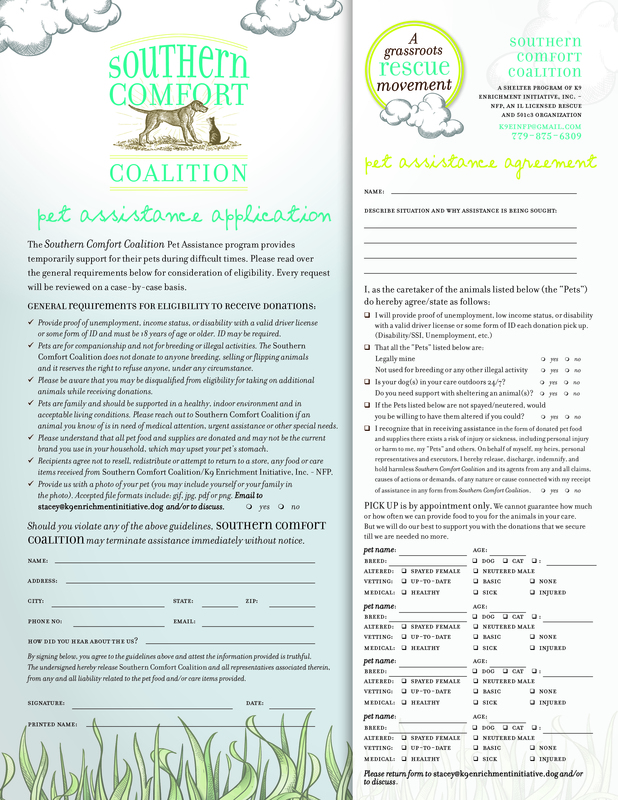 The Southern Comfort Coalition Pet Assistance program provides temporarily support for their pets during difficult times. Please read over the general requirements below for consideration of eligibility. Every request will be reviewed on a case-by-case basis. Provide proof of unemployment, income status, or disability with a valid driver license or some form of ID and must be 18 years of age or older. ID may be required. and it reserves the right to refuse anyone, under any circumstance. animal you know of is in need of medical attention, urgent assistance or other special needs. Please understand that all pet food and supplies are donated and may not be the current brand you use in your household, which may upset your pet’s stomach. Recipients agree not to resell, redistribute or attempt to return to a store, any food or care items received from Southern Comfort Coalition/K9 Enrichment Initiative, Inc. If pets listed below are not spayed/neutered, you are willing to discuss having them altered if the services are sponsored. FOOD PICK UP is by appointment only. We cannot guarantee how much or how often we can provide food to you for the animals in your care. But we will do our best to support you with the donations that we secure till we are needed no more.